✅ Trip Verified | I had a flight from the Berlin to Hurghada 24th January. I and my friend took the emergency exit row seats because the leg room was more generous and the whole row was free. The staff started immediately in a not polite form tell us that we have to turn off our phones even if they were already turned on the flight mode. When we asked for a glass of water they denied our request (the flight took longer than 4 and a half hours). Its unbelievably terrible service! will always try to avoid flying via this airline. ✅ Trip Verified | Istanbul to Düsseldorf. 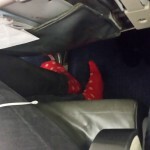 The worst of the worst, during the whole flight, none of the crew smiled. During the flight I went to sit in another seat, that had a little more for my legs. And right after I sat the attendant came to me saying I'm not allowed to sit over there even if it's empty. It costs 2 0euro. Not only me but another elderly man. That's not human. 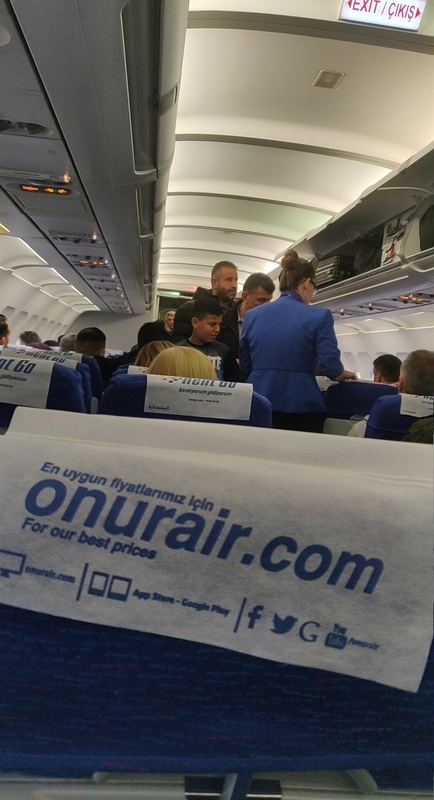 ✅ Trip Verified | I travelled on Onur Air from Makhachkala to Istanbul on 20th September. It was an early morning flight so I got to the airport the night before. International flights check in upstairs at Makhachkala airport. The airport departure screen only showed in Russian and a friend looked up the internet for my flight number which was displayed. After checking in we waited in one lounge and then were transported to another lounge by bus. This was a bigger lounge that could hold everyone in comfort. The flight was uneventful and got to Istanbul in the early hours of the morning. I will always check Onur Air if flying where they fly. "We never got a refund"
✅ Trip Verified | Istanbul to Berlin. 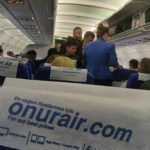 Onur Air is the worst airline I've travelled. While you're standing in the line for check-in in the Ataturk airport there are security guys of this airline who check passports of random people: they asked me about what I was doing in Turkey, what do I do in Germany, what is my profession, how long did I stay etc. After that they took a picture of my passport and my residence permit on their camera without any explanations - this is violation of data privacy. Regarding planes - they are old and look very cheap inside, legroom is so small you can barely fit your knees(and I am only 177cm high). Crew's English is so bad I didn't get anything they said during the flight. Summary: never again for any price, I'd better pay 50 eur more for Turkish Airlines or any other alternative but won't go through this humiliation again. "does not provide free water"
✅ Trip Verified | Antalya to Munich. This airline does not provide free water, they make you buy small bottles. This airline does not have special baby "beds" or shelves to provide safety for traveling babies. Moreover they did not provide the first row for families traveling with babies. The leg room is minimal and babies DO NOT get any special treatment. We had to stand in a queue for ages even though we were supposed to get to the airplane faster because we had a month year old with us. The attitude of the stewardesses is truly terrible. The announcements made in English are impossible to understand because of the pronunciation. To sum up: never again Onur Air. ✅ Trip Verified | Flew Onur Air from Izmir to Istanbul. Horrible confusing experience. Flight scheduled for 20.45hrs departure. Waited at gate. Aircraft delayed. No reason given. Gate switched, announcements primarily in Turkish. 20.45hrs comes, still no aircraft and waiting passengers get restless. 22.00hrs no answers and gate staff inform passengers to go to Onur Air desk in ticketing hall. Passengers very angry, banging on desk, shouting all in Turkish and no credible explanation (in English) given. Onur Air agent breaks down in tears. Passengers demanding answers, no answers given. 22.30hrs aircraft arrives. Departs at 23.00hrs. On arrival in Istanbul, Metro stopped for the day, had to use Havabus to get downtown. ✅ Verified Review | Samara to Antalya. I rarely write reviews even if the service is bad but I had to review this airline for the sheer fact it seems they went out of their way to be terrible! Firstly we booked a flight to depart at 17:30 but without telling us they moved this flight to 02:55 the next day. When we arrived for the flight at the new time the flight was delayed until 05:30 again without any information. I called the airline to check on an update and they said they could see no problem. Truly terrible service, avoid at all costs. "do not book with this airline"
✅ Verified Review | Kayseri to Istanbul. I had flights booked with Onur Air both in April and May 2017. Both times my husband and I arrived at the airport to find out our flight had been cancelled several weeks before and we were not informed. The airlines claims that they sent an email or SMS, they even verified that they did have our correct contact information, but we searched through every single email and SMS we had and there was absolutely nothing letting us know our flight had been cancelled. The first time it happened we were luckily able to get on another flight 1 hour later. This time, all flights to our destination are booked for the entire day. Meaning, we will have to wait until the next day for a flight (spending money on another night at a hotel and each having to take an unpaid day off of work). 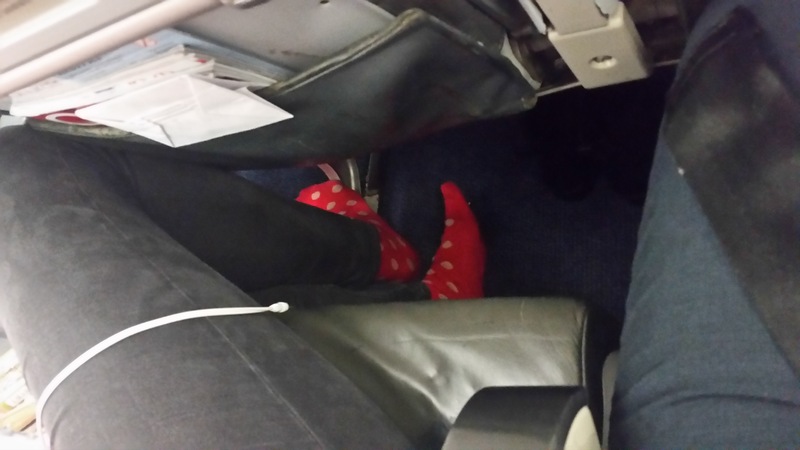 This is unacceptable and I advise that you do not book with this airline. It's a disgrace. 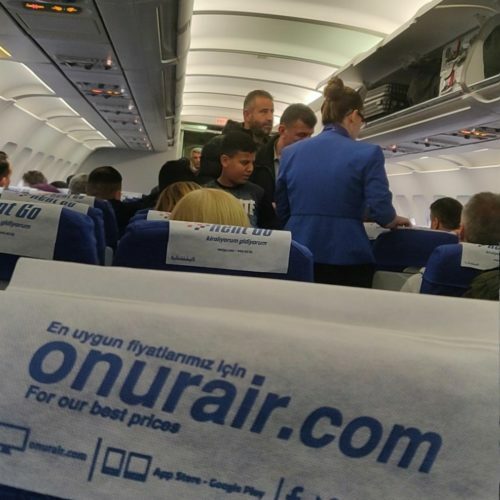 "a good deal for the price I paid"
✅ Verified Review | I flew Istanbul-Berlin-Istanbul for a business trip with Onur Air. The airline was providing a free checked baggage allowance, so it was a good deal for the price I paid. The online check-in was confusing and I had the impression that it was paid service with this airline. In Ataturk (IST) airport there was an Onur Air common check-in counter which was very efficient and I did not wait more than 5 minutes to check in. However, on the way back in Berlin-Tegel, Onur Air had a terrible check-in line, where I waited for 1 hour. It was horrible and I assume that those who have cabin baggage really waste their time (they cannot check-in online to speed up the process). We flew a Pegasus Airlines plane for both flights, there was not enough leg space and there was catering available for a fee.